When I first started writing this blog in the summer of 2005 it was as a result of going to see a play which, instead of the pleasant evening out I was expecting, turned out to be a barely disguised piece of anti-Israel propaganda. I have lost count of the number of times since when trips to the centre of London have been spoilt by either anti-Israel demonstrators trying to stop cultural events with Israeli connections or anti-Israel propaganda disguised as art. I have blogged about this on numerous occasions such as an exhibition at the Saatchi gallery last year. The extent to which the demonisation and deligitimisation of Israel has infiltrated British consciousness has now reached epidemic proportions and I was confonted by an especially pernicious example today at the Serpentine Gallery, a small gallery in the centre of Hyde Park. Serpentine Gallery will receive £904,499 in 2008/2009, £928,920 in 2009/2010 and £954,001 in 2010/2011. As if to prove how pertinent he remains, the new works at the beginning are concerned with the outrageous behaviour of Mossad, the Israeli secret service. In 1986, Mossad kidnapped the Israeli whistleblower Mordechai Vanunu in Rome, after he had revealed in this newspaper that Israel had developed an independent nuclear deterrent and was sitting on a stockpile of 100 nuclear warheads. Tried by a secret Israeli court, Vanunu managed to write the details of his kidnapping on the palm of his hand and thrust it against a car window in front of passing photographers. This is the image that Hamilton, for some weirdly prescient reason, has chosen to repeat, just as we Brits are feverishly checking our passports to see if we too have been to Dubai. Hamilton doesn’t lecture or rant or orate. Instead, he identifies a telling image, then lets it ripple through your thoughts of its own accord. 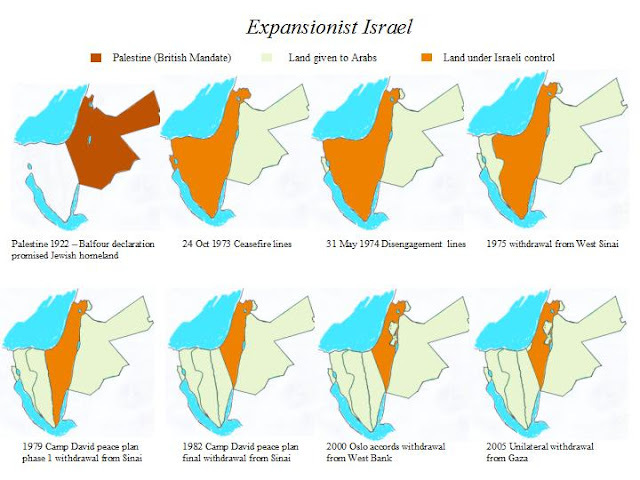 The fuzzy picture of Vanunu is accompanied by a pair of maps, one showing the boundaries of the state of Israel as fixed by the UN partition of 1947, the other showing them as they are today. Stan Laurel has turned into Oliver Hardy. The map is a lie and/or misleading in several respects, which are laid out in the appendix below. To present it as 'art' demands some answers from the Serpentine Gallery and the Arts Council, especially as we the taxpayers are paying for it and visitors at the gallery are not given either relevant information about the context or reasons why the map is wrong/misleading. In the broader context I'd like to know why, with everything going on in the world, only tiny Israel's existence seems to inspire the rage of the artistic and cultural elite. Islamists are massacring Christians, Hindus, Buddhists, Jews but most of all fellow Muslims, on a daily basis all over the world but especially in places like Iraq, Afghanistan, Pakistan, Iran, Nigeria, India, Somalia, Yemen, Thailand, Indonesia, Philipines, Lebanon, Egypt, Kenya, Russia - to date over 15,000 deadly terrorist attacks by Islamists just since September 11, 2001 (see Religion of Peace website for a complete listing of them all). Countries like Saudi Arabia, Syria, Turkey, Lebanon, Jordan and Iran have ruthlessly used massive force to crush internal rebellions and external enemies usually killing more people in a single operation than Israel has killed defending itself in all its wars put together. All of those countries (along with the rest of the Muslim world) also indoctrinate their population with anti-semitic hatred and practice openly apartheid policies (even in Jordan, which actually has a peace treaty with Israel, it is illegal for a Jew to be a citizen). Only last week the President of Turkey threatened to expel the entire Armenian population as a reprisal for the Americans finally recognising the Turkish (i.e. Islamist) massacre of Armenians in 1915. None of that stirs the feelings of the artistic elite. Only Israel's attempts to do defend itself from relentless terrorist bombardments and threats to its existence inspire their anger. What can the film teach audiences? Baddiel answers: "The main Muslim characters in the film are not suicide bombers or fundamentalists, they are just ordinary people and the film tries to show them as such". What does being Jewish mean to you religiously and culturally? Baddiel answers: "Probably the key speech in the film is when the rabbi, played by Matt Lucas, doesn't let Mahmud in to see his father, who is dying, because he can't say the Shema. That is the definition of Judaism." Obviously Baddiel does not see the irony of his determination to portray Muslims as 'just like us', but to portray Jews as religious fanatics. In his own naive way he is no better than Richard Hamilton. Only the Jews of Palestine considered themselves Palestinian before 1948. The Arabs - most of whom had come to Palestine from Egypt and Syria because of the economic opportunities opened up by the Jews - considered themselves to be Syrian. Despite the fact that 80% of mandate Palestine (not shown at all on the exhibition map) had already been granted to the Arabs exclusively to become the new state of Jordan, the Jews of Palestine accepted the UN partition plan of 1947. The surrounding Arabs states did not accept it and launched a war of annihilation against the Jews (during and after which some 1 million Jews from Arab countries were forced to leave - most of them came to Israel). 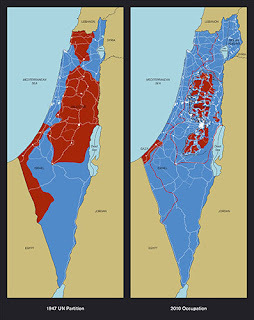 The result of the war that was intended to murder every single Jew in Palestine was that the invading Arab armies were defeated and the Jews controlled slightly more territory overall than was part of the 1947 plan; however, they also lost some territory such as the Jewish quarter of East Jerusalem (including Judaisms's holiest sites such as the Wailing Wall) and Gush Etzion that even the 1947 plan had not considered to be under Arab control. 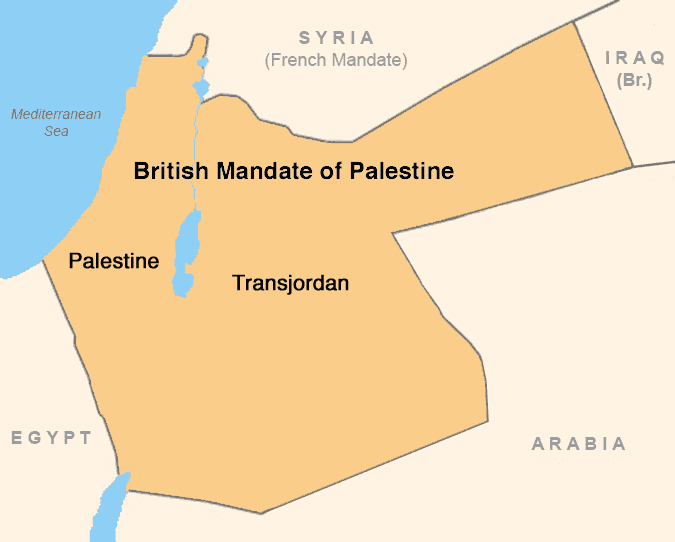 The UN accepted the 1949 armistice line as defining the borders of Israel, while calling for East Jerusalem (now under Jordanian occupation) to be 'internationalised'. The Arab states refused to recognise the State of Israel and have continued to this day to try to destroy it. The Jordanians who occupied East Jerusalem in 1948 expelled every Jew and destroyed every synagogue in the old city. Not a single Jew was allowed to enter Judaism's holiest sites until 1967 when, after the Egyptians, Jordanians and Syrians launched another attempted war of annhiliation, Israel regained control over the old city and other areas. 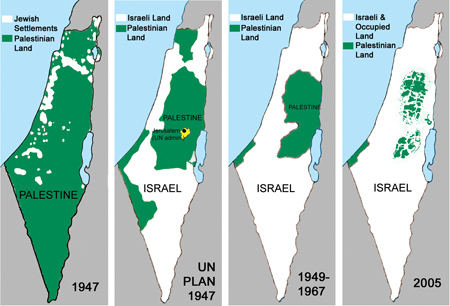 Israel offered to withdraw from all the newly gained territories in return for peace but the offer was rejected by the Arab countries. 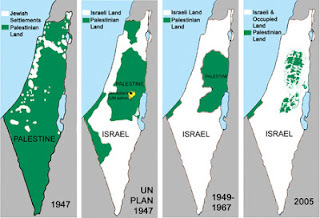 With the exception of Jewish East Jerusalem Israel has essentially made the same offer over and again ever since but it has always been rejected. Despite this Israel has returned the whole of Gaza and most of the West Bank to Palestinian control. But the Arabs continue to demand the destruction of all of Israel. The tiny strip of land that is Israel is less than the size of Wales; just counting the 22 Arab Muslim countries that surround it (i.e. ignoring the 36 other Muslim countries in the world) the land mass of the Arab countries is about 700 times as great. It should also be noted, that Jews and Christians are second class citizens in the Moslem world. And, in most Arab/Muslim countries no new Jewish or Christian houses of worship can be built, and existing ones are frequently demolished or fall into disrepair. In contrast, Arabs/Muslims freely participate in Israeli politics and have complete freedom of worship. Dear Edgar, it is great finding your blog! That is an excellent article. as an artist and Jewish myself I feel that the art world is filled with jew-hating jews like Saatchi who promote those revolting nazis the Chapmans and all that garbage of the so-called YBAs. After reading your piece I called a friend because I want to make a protest against this exhibition. Make posters with the true picture and facts about Israel, Hitler and the Mufti of Jerusalem and how its become a money-spinner to trash Jews in art. I have done some of my own research and i think I have been waiting for someone like you and your blog to prod me into action. There is a female tutor at St Martins who is doing a special project to promote Moazzam Begg a Gitmo terrorist and his Cageprisoners. I watched a video on youtube where this ghastly hag was clapped by a load of hijabed gitmo-groupies, while she spoke on stage with Begg and 2 others. We are going to plan and attend any anti-Jewish/Israel event and protest, including art, theatre and where islamonazis gather to harrass Jewish musicians etc. We must fight back. could be very powerful for handing out wherever the Leftist/Islamist moonbats try to intimidate Israelis. I also went to this exhibition. Generally I admire Richard Hamilton as an artist, but was astounded to see the 2 huge maps of Israel side by side, especially having returned from there the day before! However my astoundment (is that english?) turned to a type of smugness, why? because Israel as you have so cleverly shown is oh so small, and we the Jews so small in numbers, yet everywhere you look we make a story, an impact, something to paint about, something to act about. Well in a way that's quite nice is it not? Others are making us stand out in the crowd, actually they are emphasising the fact we are the Chosen People! This makes me proud, that we are such a constant topic of conversation. What is it that makes us so topical all the time? People act as if they are jealous of our land and religion? What is their problem? For the real fact you are lucky insofar as you are in London. Go to the British library, take along someone who is good at Latin and look for the book by Hadriani Relandi. It is a travel book from late 1600/early 1700 where he visited all the places mentioned in the bible. You will learn that at the time Gaza was a prosperous Jewish village, the only "Palestinians" about were some wandering bedouin tribesmen. It also details some population statistics, I admit I have forgotten them, if you do look it up please post them on your blog. I would certainly like to investigate the source. Although I am an atheist, I truly feel sorry for the plight of the Jews over the centuries. Jews have been persecuted by the Christians and Muslims both. But presently, their persecutors are the Muslims and Israel must be saved from the barbaric Arabs. Isn't it ironic that you go on about being persecuted against yet you are endorsing the persecuting of others? This is the beautiful irony that the nonstate of israel is governed by and it renders every argument you make, along with all your zionist buddies, completely and utterly void. Read a book or something. Hug an arab. Goodluck haters. A very well put together and level-headed work you have done. As someone who grew up respecting people like Richard Hamilton I find many of then now deeply dissapointing as human beings. The entire art system is one tightly policed left-wing politically-correct hegemony. Nothing gets in to challenge the system. I like to think I am an artist working outside that system (although, in their circular way, they would say that an artist outside the art-system is an oxymoron). this article is good. But it doesnt say about pakistan's internal problems realted to terroists. You are total fantasists - where were you in 1948 when Palestinian families were forced to leave their homes? How can you try to excuse the apartheid policies of the Zionist cabal in the European colony that you call Israel. You cannot have it both ways, if you want to conflate the Israeli state with Jewishness than you must accept political criticism and not confuse it with anti-semitism. Younger people in Europe are no longer subject to the guilt trip foisted upon their parents. Colonisers in Palestine will soon find they have no friends.